This is the before photo, before I take a cut at restoring this photo. 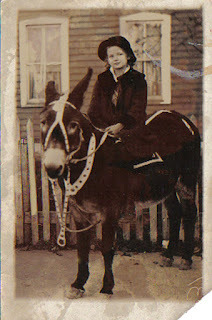 It is my grandmother as a young girl and it evokes strong emotion in me. A bit of me feels lost in it. I knew my grandmother so well - or so I thought - but this photo seems to be of someone I didn't know at all. It's a strange sensation to know someone for a period of time, to be close, and then to realize that there was so much more that you didn't know - and not in a bad way - just in a left wanting more way. So I'm going to take my time and restore the photo and then I'll tell you more about an amazing person. Another hybrid art sample in this work featuring the AmazingTori and Andrew. On The Brink is all about big change. Emotional turmoil generated by new love; young love, and pending transition, from the remnants of childhood to the real world. The simultaneous coveting what was, and craving what is to be. This is a continuous rollercoaster ride and we are along for it. Hurling over the tracks, hoping not to derail. Mopping up tears and taking in the smiles. This work conveys all of that for me - but then I'm biased. I look into those eyes every day.